The EN 10219 Electric Resistance Welded Steel Pipe can be made in S235JRH,S235JR,ERW320,ERW360,ERW430,S275 NH,S275 NH,S355NH, S460NH and L460 NLH and so on. The allowable sum of the positive deviation and negative deviation of the circular,square and rectangle section bars,which use the cold welding method,is defined. The maximum outer diameter(OD) for the EN 10219-2 ERW steel pipe is 850mm and the maximum wall thickness is 60mm.The maximum length for a single pipe reaches 20000mm. The EN 10219 Electric Resistance Welded Steel Pipe is used in construction industry. 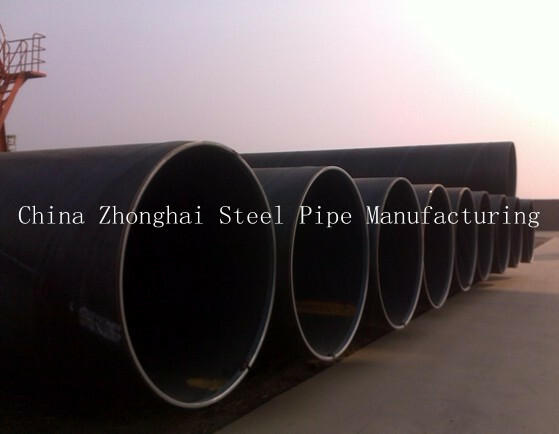 China Zhonghai Steel Pipe Manufacturing Corporation is an EN 10219-2 ERW steel pipe manufacture and supplier. We also offer seamless pipe,spiral pipe and welded pipe.Our high quality products are offered at competitive prices.China Zhonghai Steel Pipe Manufacturing Corporation is located in China,We have more than 15 years experiences in manufacturing and exporting EN 10219 Electric Resistance Welded Steel Pipe.